Redis on Flash technology combines RAM and flash to store large datasets in Redis with much lower cost per GB. With Redis on Flash, you can extend RAM onto flash memory and keep larger datasets in Redis, all without losing Redis’ performance advantage. To provide the best data access performance, Redis on Flash uses smart data placement, storing frequently accessed data in RAM and less frequently accessed data in flash. The cost savings to store over 10 terabytes can often be more than 80%. Use the power of Redis and the reliability and scalability of Redis on Flash to deliver high-velocity analytics such as behavior-based personalization; recent purchases or trending items in e-Commerce and retail applications; leaderboards and top scorers in gaming applications; real-time fraud detection; real-time ad placement, etc. Use the high-performance data structures of Redis to continuously ingest high velocity data–such as millions of events from websites or IoT devices–with very little hardware. Redis Sorted Sets accelerate processing and analysis of time-series data by orders of magnitude compared to other disk based key value stores. Use Redis on Flash to gain a high performance, highly available, time-series-processing engine. Redis offers a rich set of data structures, atomic counters and features (such as “time-to-live”) that will help you count and regulate items. Redis Enterprise Flash enables you to enforce traffic shaping and rate limiting on extremely large data sets, while maintaining great price efficiency. 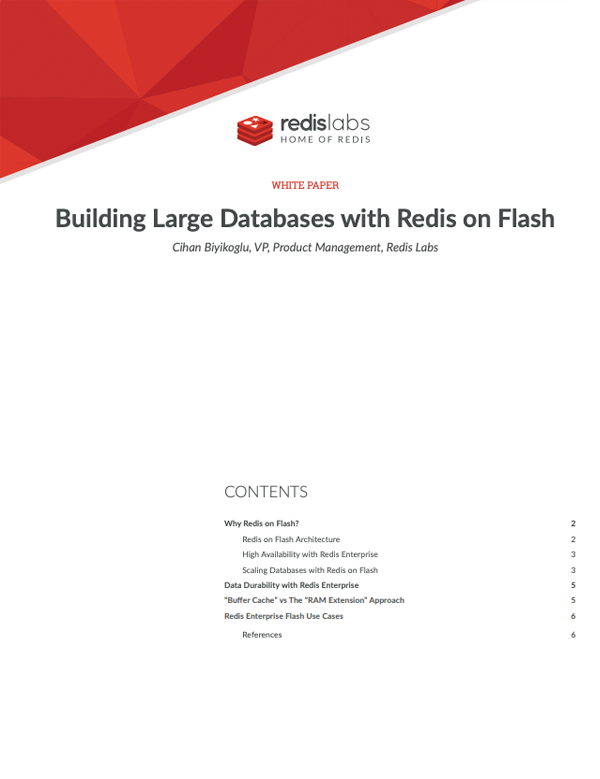 This white paper explains the technology behind Redis on Flash and the architecture for building large databases using the technology.